1. 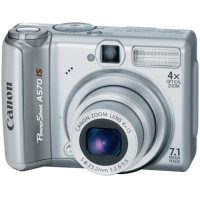 A Canon PowerShot A570 IS digital camera. Cool. Now I'll be able to take my own pictures. Yay! 2. Harry Potter and the Deathly Hallows (at Wal-Mart, well after midnight). I'm going to start reading it quite shortly. Don't spoil it for me! While at Wal-Mart this evening, I also bought a few notebooks for school in the fall, but that's not so exciting. I promise I'll get camp pictures (from my dad's camera) up shortly. Have patience, and give me a little time to get through the 362 pictures I took! Random tangent: "Dollar" starts with "D," and yet it's symbol ($) looks like an "S." "Pound" starts with "P," and it's symbol (£) resembles an "L." At least the EU got things right by making the Euro symbol (€) look something like an "E"! I got a Canon PowerShot A540 last summer, and there are some features I haven't figured out, so maybe you can help me out when we see you in a couple weeks! I finished the Harry Potter book Saturday night, and it was a satisfying read. Enjoy! I also have read the Harry Potter book and am reading a second time! I hope that you love it as much as I did. I'm just shy of halfway through it now... unfortunately, I've got enough going on right now that I can't just sit down and read for hours on end! But considering that I bought it Saturday night, I'd say I'm doing fairly well. I don't want to rush to the end, do I? i bought it saturday night, i finished it yesterday morning. it was absolutely amazing. once laurel, my mom, my boss and my aunt all read it, i'm going to reread it. No, don't rush. Or you, like Barb and me, will be reading it a second time! I finished the book just minutes ago. Really nice. I liked it a lot. you never did get to reading my VBS post that you said you were going to read. And I haven't gotten around to posting camp pictures, either. Oh, well; I haven't been getting around to much lately, it seems. O Canada!, Baptism, and Pictures!